Sadjadpour, the Carnegie analyst, finds it remarkable that so many politicians have supported a group with so much baggage. “In some cases it’s greed, in some cases it’s cluelessness, in some cases it’s remarkably poor judgment, and often it’s all of the above,” he said of the political support. What I still don’t quite understand is how so many high-ranking and prominent people could be genuinely clueless about a group that they are supporting on a regular basis. It would be more understandable if they were simply motivated by anti-Iranian animus and chose to align themselves with the most distasteful allies possible. That wouldn’t make their cavorting with terrorists any less disgraceful, but it would make sense in a very cynical way. What doesn’t make any sense is how so many prominent figures could be so thoroughly ignorant about the background of an organization whose cause they are promoting. At some point, the ignorance defense isn’t credible. Since the MEK’s American advocates obviously know so little about the group’s history, why should anyone else trust their judgment when they say that the group shouldn’t remain on the FTO list? “Why are they picking on you?” asked one of many outraged emails from supportive readers in a similar vein. “Why aren’t reporters going after the other big names who are raking in big money for speeches like this?” The quick answer: They don’t work for newspapers. In fact, some reporters, including Justin Elliott, have been publicizing the pro-MEK activism of former officials, politicians, and retired military officers for many months. These reporters have been “going after” pro-MEK advocates for quite a while, so it’s absurd to think that Page received more scrutiny than anyone else. The reason that these other individuals haven’t been censured by anyone is that they are generally no longer answerable to any employer or organization. In that sense, they are free to lend their support to a terrorist group in a way that someone in Page’s position isn’t. Even though they would all seem to be offering “material support” to a terrorist group, there is no real danger that any of them would face charges. Much of M.E.K.’s support, Gobadi says, comes from the Iranian diaspora. While he doesn’t name the group’s U.S. supporters, the Senate disclosure database reveals the Iranian American Community of North Texas and Iranian American Community of Northern California have been most active. Dozens of similar community groups came into existence after the U.S. government shut down a partner office of the M.E.K. in D.C. in 2003, but many have since disappeared. Requests for comments from both community groups were not returned, but it’s clear that they have had enormous fundraising and sway. IACNT and IANCC paid the lobbying firms in Washington thousands of dollars to get signatures for the congressional resolution. They paid the speakers lobby thousands of dollars to get Rendell, Giuliani and Crowley, participants said. In recent weeks, new questions have been raised about whether private meetings, conference calls and other contact with officials at the State Department and elsewhere in the administration over the past year require the advocates’ registration as lobbyists or agents of a foreign entity. This false claim that they represent Iran’s democratic opposition is exactly what pro-MEK advocates say about the group all the time. Terrorism by itself is a word that sends a shiver of fear through the counter terrorist pros and the victims who have not yet come through the experience. But the word is utterly meaningless when it is employed by the statesmen and officials who set out divergent paths of combatting terrorism but their action is in absolute contradiction to their words bragged to their own citizens. Maybe the illusion of being politically powerful, and luckily few of the kind actually assume a leading political power, means you have virtually nothing to fear of and you are justified in whatever you may do, even if it is shaking hands with terrorists or bowing down to them. That is what happens to Newt Gingrich, the former Speaker of the House and the GOP nomination for the US presidency, whom the US voters have a low opinion of and think to be the lowest form of a candidate. Mr. Gingrich is not the only former US politician to openly support MKO but he might be the only one to have bowed down to so broadly to the leader of a designated terrorist group. Appearing at a rally held by MKO on June 23 in Paris, Mr. Gingrich, before delivering his speech, neared the end of a long line of attendees to face Maryam Rajavi, who leads the terrorist cult of MKO in the absence of her husband Massoud Rajavi. Under the impression of whatever atmosphere, he smiled, and folded at the waist and bowed to her in a Japanese style. Mr. Gingrich is a known American figure for his uncompromising stance against Iranian regime particularly for post-hostage crisis. But his error made in his speech after the bow down show was more striking. He sharply rebuked Iranian regime for the 1979 hostage crisis, in which Iran held American embassy officials hostage for 444 days. 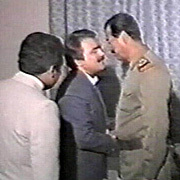 Although he meant to provide it as a proof of Iran’s anti-American feature, he seemed to have failed to remember, knowingly or unknowingly, that MKO not only had supported and participated in hostage-taking but was the zealous side that intensified the created tension and challenged both Iranian and American sides. Although MKO group denies to have played a role in the embassy takeover, and that is true to say it played no role in the occupation of the embassy, it turned a hot supporter of the event as verified by the US State Department Report of 1994 disclosing facts on the group: “As part of that struggle, they assassinated at least six American citizens, supported the takeover of the U.S. embassy, and opposed the release of American hostages”. However, evidences never fail to reveal the truth. There are published evidences and facts by the group’s own publications that prove the critical role of the organization in intensifying the hostage crisis so as to win a public support to initiate an aggressive campaign against what it referred to as the main Capitalist camp, namely the US. Maybe MKO never anticipated that in less than two decades they would have to make desperate attempts to acquit themselves of what they believe to be false accusation. For years MKO has struggled and lobbied to remove the terrorist tag. However, it has received all forms of praise and advocacy from among the high-profile American politics. Most of these advocates collected big bundles of money from the abundant display of the group’s extravagance for their support regardless of being engaged in an illegal business. But, to bow before a terrorist, can the gain be equated to loss?! A meeting was held on Monday 21 November between officials of the Diyala province and family representatives of the people trapped in Camp Ashraf. 1- There will be no compromise on the decision to deport the MEK. 3 - There will be no compromise on respect for human rights laws and agreements and therefore they will not be forcefully returned to Iran. He said that the overall decisions will rest with central government but as far as Diyala is concerned there is no room for the MKO anywhere inside the province. This has been announced repeatedly by practically all the leaders of tribes and local officials. Dr Al-Mahdwe dismissed completely the MEK propaganda in which they claim they have some support and said that to claim, after what they have done, that the MEK have even a small percentage of support in the province is simply a lie and is purely fictitious. General Abdol Amir Al-Zeidi, is the commander of the regional army and responsible for the protection of the camp. He said that he has met many escapees from the camp. The last one was a woman who had to drag herself out and crawl for about half a kilometer before reaching the Iraqis. He said the leaders are the problem not the trapped people and if given order we are prepared to transfer them out of the camp with the utmost dignity and care and respect for their wellbeing. He said this can be checked by reporters and human rights organisation who wish to observe the operation. The General said that in the event they receive the order to evacuate the camp, they will try their utmost to stop the leaders killing the hostages and the disaffected members as they did before. According to the General most of the people who were killed in April 2011 were in opposition to the leadership and had been shot in the heart or in the head. But the leaders tried to cover up such facts even though the evidence is unequivocal. He said reports will be handed over to the authorities to deal with the cases of murder of these people at the hands of the hostage takers. Massoud Khodabandeh heading the delegation thanked the Government of Iraq and asked the Governor of Diyala and the General to help inform the people trapped inside about their rights and to counter the lies given to them by the hostage takers and cult leaders. Ms Abdollahi on behalf of the families asked for help and for care to be taken when dismantling the camp to institute particular safeguards to protect the relatives of the picketing families. Ms Sanjabi, (formerly a member of the MEK Leadership Council), who managed to escape some months ago, explained the latest developments inside the camp and gave some ideas about how the leaders may try to plan and execute violent resistance. Mr and Mrs Mohammady from Canada who have been trying since before 2003 to rescue their daughter from the camp, presented some documents including copies of the arrest warrants for some leading members of the MKO inside the camp which the General received and promised to follow up. Other delegation members including Mr. Azizi a Human rights activist from Netherlands Mr Sadeghi, one of the few people who managed to escaped from the camp during the time of Saddam Hussein, Mr Ghashghavi who spent years in Abu Ghraib, where he was sent by Rajavi, Mr. Ferydouni who managed to escape a few weeks ago and Ms Mahdian whose husband, a registered POW, is trapped inside the camp also participated in the meeting. Press and media were present and the Governor and the General gave a media briefing following the meeting which was broadcast live through official and national media. 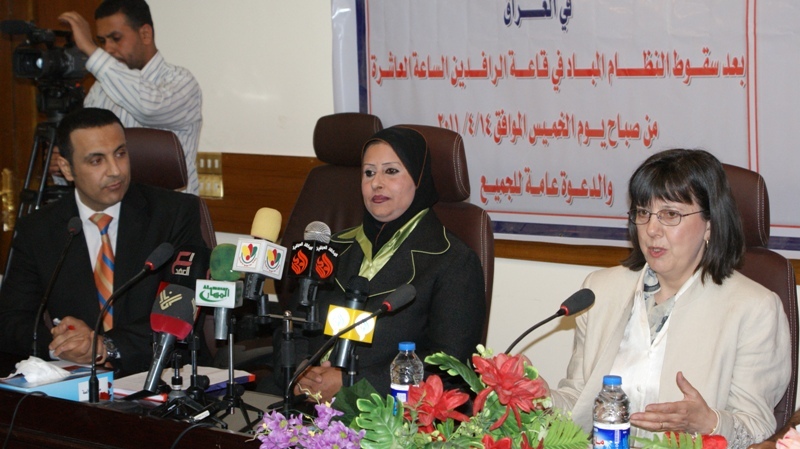 A Conference in Baghdad University on Friday 25 November was organised by Al-Edalat Al-Iraqi Society, headed by Dr Nafe Al-Isa, which represents the families of 25,000 Iraqi victims of the MEK. 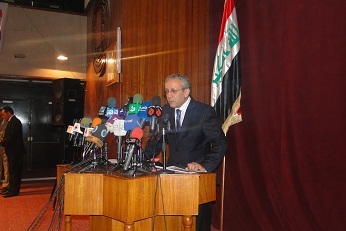 The Conference was held in Al-Hakim Conference Centre in Baghdad University and hundreds of tribal leaders, University lecturers, Governmental representatives and officials, NGOs and media representatives filled the salon. 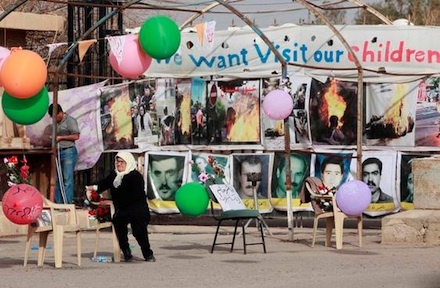 Although Camp Ashraf and the MEK is an issue specific to the government and citizens of Iraq, the Conference organisers made sure to invite Western agencies, such as the UN, EU and diplomats who have claimed or expressed an interest in Camp Ashraf. Unfortunately, however, any such invitees were apparently unable to leave the Green Zone to attend the Conference and talk to the delegates. Opening the Conference, Dr Nafe, speaking on behalf of the families of victims of MEK violence, asked that those MEK leaders who were responsible for this violence be brought to justice before their deportation. Speakers from the government and NGOs all emphasized that the deadline for deportation must be strictly adhered to and that Iraqi and international law against terrorism and crime must be upheld. Other speakers, in particular the tribal leaders spoke about the MEK’s crimes which they have witnessed in recent years in Diyala province. They were highly critical of the failure of the American military to dismantle the camp after 2003, and were scathing of the continued American backing which allowed the camp to be used for training and inciting terrorism against Iraqis. On this theme, Jasem Al- Ebadi, Member of Parliament and member of the parliamentary Human Rights Commission used his speech to criticise EU efforts to keep the terrorist group intact and their opposition to the deportation process. He commented that if they are so in love with this terrorist group, why don't they take them to their own countries? Mr Adnan Al-Shahmani, head of the Parliamentary Committee to oversee the expulsion of the MEK announced in the Conference that the deadline would not be extended and that the camp will be closed by the end of the year. He also explained that the Iraqi Judiciary had issued its final verdict that the camp should be closed and the land handed back to the original owners. Mr Al- Shahmani also criticized the West for its silence toward the crimes committed by the group against civilians, and asked international communities not to remain silent in the case of the abuse of the rights of the families of the victims of the MEK. Mr Al-Shahmani also met with the representatives of the families of hostages inside Camp Ashraf and the delegation from European countries who are campaigning to ensure a peaceful outcome to the standoff at the camp. Massoud Khodabandeh, from Middle East Strategy Consultants which is working with the Iraqi government to resolve the situation at Camp Ashraf, introduced his book ‘The Life of Camp Ashraf – Mojahedin-e Khalq Victims of Many Masters’ to the Conference. 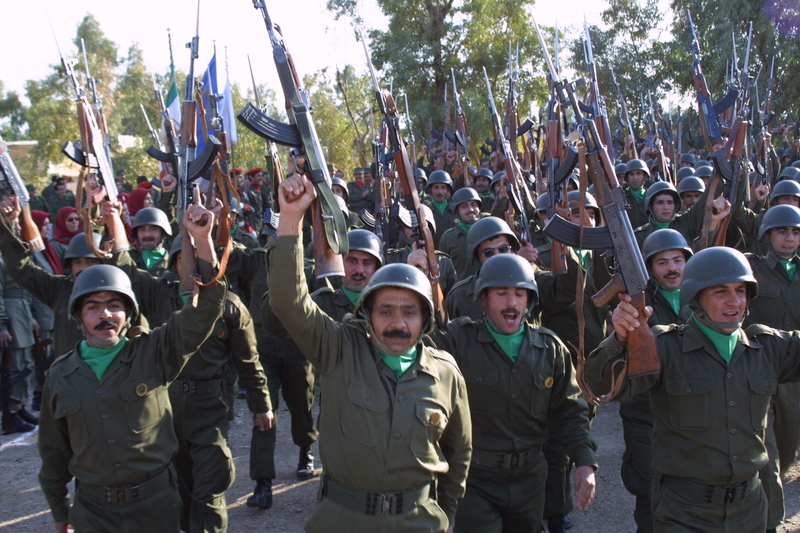 The book places the MEK in the context of its foreign ownership and concludes that these owners have invested heavily in the MEK’s ability to commit acts of violence and terrorism, and that this is the reason for western resistance to closing the camp. The book particularly highlights the MEK’s refusal to allow residents of the camp to have contact with their immediate families as a fundamental human rights abuse of every person in the camp. 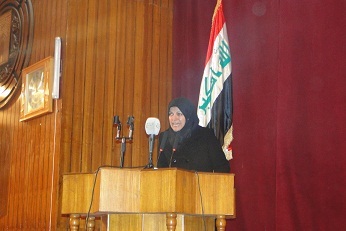 Ms Abdollahi represented the families and asked for help to release the hostages (including her own son) from the camp. Ms Abdollahi reminded the Conference that the families’ struggle to find their relatives had been going on since 2003 and that a permanent picket had been established two years ago. She stressed that when searching for a solution the families of course have the security and safety of all the residents as their utmost priority. The families have the simplest and easily granted request – to visit their loved ones who are in the camp. This does not depend on the removal of the MEK from Iraq and would be simple to do. The only barrier to this request is the order of the MEK leaders Massoud and Maryam Rajavi. They can easily resolve this issue by ordering that the families of MEK members be allowed to have free and unfettered contact with their loved ones. 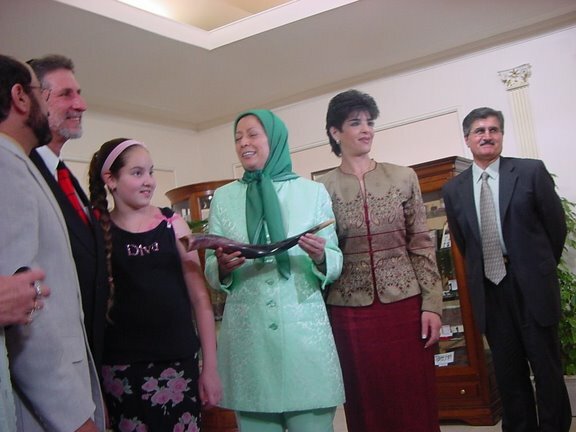 Ms Sanjabi is an ex-member of the MEK’s women only Leadership Council. She managed to escape from Camp Ashraf very recently, and explained the dire situation of the women inside the camp, detailing disturbing and shocking human rights abuses which are currently being carried out against the residents by the MEK leaders. 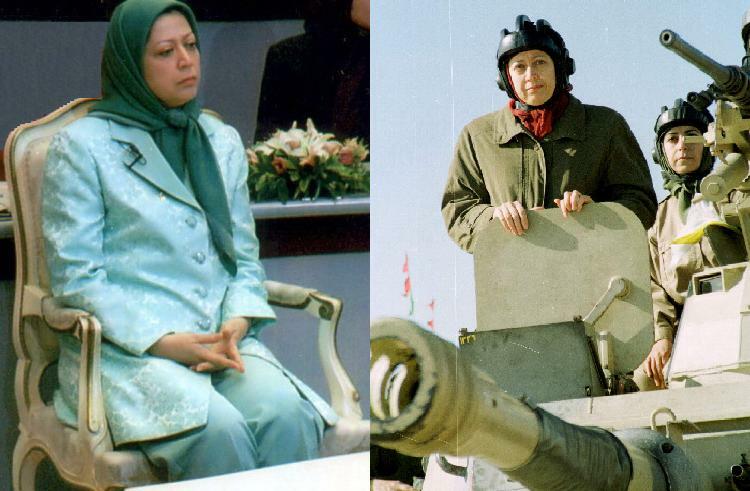 Ms Mahdian, whose husband is a hostage inside the camp, explained how Saddam’s Intelligence services gave her husband to the MEK as a slave, even though he had been and is still a registered POW, captured at the start of the Iran-Iraq war. Ms Mahdian explained that her son has not seen his father for the past 25 years and the MEK would not allow this visit even after two years of picketing. Mr Sadeghi from Germany, who is one of the few members who managed to run away from the camp successfully during the time of Saddam Hussein, presented and explained evidence of recent MEK interference in the internal affairs of Iraq, their collaboration with Saddamists and other terrorist groups, and the MEK’s active role in intensifying the insurgency. Mr Ghashghavi also from Germany, served eight years without trial in Saddam’s prisons including Abu Ghraib for refusing to carry out Massoud Rajavi’s orders to commit criminal acts. Mr Ghashghavi explained how Rajavi and Saddam would force people to either kill others or be sent to the torture chambers themselves and be killed. Another ex-MEK member, Mr Ezati who now lives in the Netherlands, gave interviews to the media explaining the situation inside the camp and the constant abuse of human rights of the victims. Mr Ezati strongly criticized the unfortunate media silence over these human rights abuses which he ascribed to the pervasive influence of the MEK’s powerful backers who regard the MEK as “good terrorists”. Tens of ex-MEK members who work with Nejat Association in Iran, also attended the Conference and were interviewed by the media. They explained that Nejat Association, which works closely with the families of the hostages, now has the capacity to help those survivors who wish to do so, to go back to their country under the amnesty which was granted by the Iranian authorities in 2003 (which is based on the understanding that the MEK members have been subjected to the coercion and control of cult leaders) and which to date has been upheld under the supervision of the ICRC. Conference attendees were particularly interested in the testimony of three recently escaped camp residents who gave full and detailed explanations to the media about the harsh reality of being a captive inside Camp Ashraf. They spoke about the total information blackout and social and emotional isolation they experienced there. They emphasized that the leaders and the hostage takers lie constantly to the residents so that the captives have no idea about the outside world. They are made to believe that the MEK leaders are directly supported by the Americans and that if they tried to escape the camp they would be immediately shot, or now, after being tortured by the Iraqis they would be handed over to Iran to be executed without trial. They said that if they were given the true facts and information, there is not one person in the camp who would still want to stay in the desert of Iraq nearly nine years after disarmament. They urged international organizations, especially the US representatives and UNAMI, who are the only organizations with close relations with the hostage takers, to take advantage of their weekly meetings inside Camp Ashraf with the hostage takers, to persuade them to open up the flow of information and convince them to give people the right to family visits as well as normal means of communication such as writing and telephones, etc. These recently escaped hostages also urged UNAMI not to present the hostage takers as the representatives of the hostages in the media outputs. Instead they should be clear that Rajavi is no one’s representative and as long as the negotiators have not met with the hostages without the presence of the MEK commanders - the hostage takers - outside the camp, they have no right to claim anything on their behalf. They said they believe that UNAMI and the American backers of the cult are in breach of international law for siding with the terrorists as these are people who have abused the human rights of over 3000 people for decades. The survivors of Camp Ashraf are now taking legal advice to claim compensation for their suffering and losses from the MEK leaders.